Chapter 3: Analysis of the second section of Chapter 18, “Why such a strong stand against the DOT? Is the ordinary trust recommended by this “Separation of Church and State Law Ministry” and by the BLC a legal entity? See Comparison of Bible Trust (ordinary trust), Incorporation (includes corporation sole), and Ecclesiastical Law Center Trust for a concise chart of the differences each brings to church organization. See Spurious rationale for church incorporation: to hold property (Section VI, Chapter 7 of God Betrayed; Chapter 7 of Separation of Church and State) for an explanation of the ordinary trust. That chapter shows how the ordinary trust comports perfectly with Bible principle and why this author now co-labels the ordinary trust a Bible trust. Constant attacks by an organization called the Ecclesiastical Law Center (“ELC”) against the Declaration of Trust (“DOT”) and the ordinary trust thereby created which were first promoted by the Biblical Law Center (“BLC”) and now by the ordinary Bible trust of this Old Paths Baptist Church “Separation of Church and State Law” ministry (“SCSLM”) made this booklet necessary. The ELC not only has attacked the right way for many years, but also has promoted a wrong way thereby misleading untold numbers of good men of God and churches. Any believer, by dedicated study, can learn the truth about the matters addressed in this booklet. The author has been asked several times over the last few years to expose false teachings of the ELC. Since he had written the biblical and legal truth about the ordinary trust which the ELC has attacked for a long time, the author presumed that other men of God who loved the Lord and His churches would study the issues out and come to the truth. 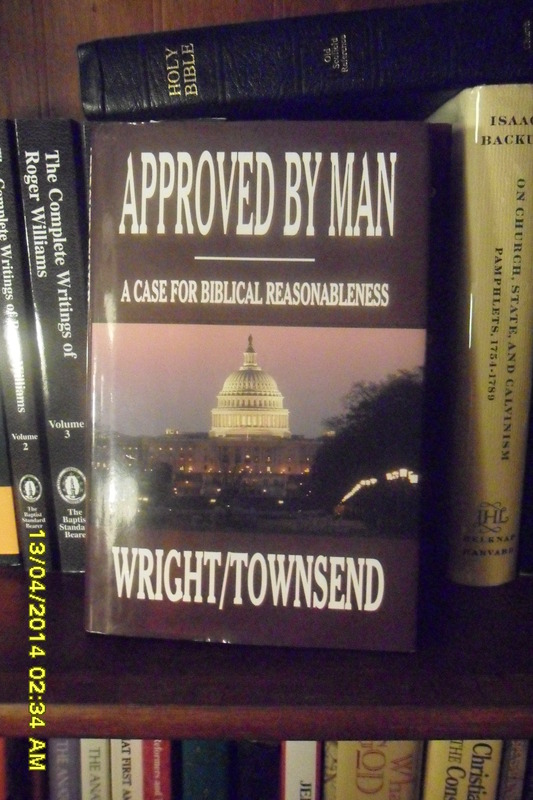 Sadly, the author recently became aware that a few good men of God continue to blindly follow Ben Townsend and the Ecclesiastical Law Center, organize their churches according to the ill-advised ELC method, and repeat the ridiculous attacks and arguments made by Townsend against the ordinary trust. Therefore, the Lord laid it on this author’s heart to directly expose the false teachings of the ELC concerning the ordinary trust. As a result, he studied ELC writings and further discovered that the ELC method of church organization is flawed legally and biblicly. This booklet does four things. First, it answers, exposes, and defeats the long published and continuing attacks by the ELC against the Declaration of Trust (“DOT”) and the ordinary trust thereby created which are promoted by the BLC and the ordinary Bible trust used by this SCSLM. See Endnote 1 for information on the Bible trust. This series of articles will prove the fallacies of the former and the validity of the latter. The central focus will be Chapter 18, “Should a Church Be Placed In a Declaration of Trust?” of the ELC book, Approved by Man: A Case for Biblical Reasonableness, by Robin Wright and Ben Townsend; that chapter is published online as well. Second, this booklet explains the SCSLM ordinary trust from both a Bible and legal standpoint. Third, this booklet exposes the very ill-advised ELC method of church organization for what it is. Fourth, this booklet, as shown by Ben Townsend’s online responses to the first 8 chapters which are analyzed in Chapters 9-13, corners Townsend, causes him to admit that “he does not know much about trusts, and that an ordinary trust is not a legal entity.” Both admissions (1) reveal that he is not and was not qualified to write Chapter 18 of Approved by Man or any of his other attacks against the ordinary trust and the DOT which creates it; and (2) raise the question, “What was Townsend’s motive for expending so much time and effort to widely publish something, which when examined, shows his ignorance and hypocrisy?” Townsend’s admissions as well as his legal and biblical analyses (generosity calls his forays analyses) which are thoroughly examined in this booklet totally expose the fact that no believer and church should depend upon Townsend and the ELC for any guidance concerning church organization. The ELC has no lawyers to guide them in their forays into the legal arena. Some may think that is a good thing, and in some cases it is. Spiritual matters should never be addressed by an unsaved person, including an unsaved lawyer or a “Christian” lawyer or paralegal whose legal education controls his spiritual beliefs and earthly actions. Both legal and biblical issues are involved in the application of the biblical doctrines of government, church, and separation of church and state; and understanding all those doctrines and making the proper applications so as to keep a church out of the legal arena is absolutely necessary for a church who wishes to glorify God. On the other hand, the unstudied and unlearned should properly prepare himself before taking on complex matters, especially when those matters are near and dear to the heart of God. A pastor has a full-time job being a pastor. He does not have the time to spend thousands of hours in preparation and then the many hours of continuing study and practice needed to become proficient in understanding law and applying that law to the world, and/or seeking to keep man’s law out of God’s church organization. Without serious training in legal research and analysis, one will find it very difficult to navigate the legal landscape in search of answers to church related issues. To understand the law of trusts, for example, one must be able to properly research the vast collections contained both online and in legal libraries. This is not to say that one who has watched a lawyer do a simple thing such as successfully countering a church property tax challenge cannot then, himself, do the same thing. Even secular people, when presented with the truth, understand that churches, no matter how organized, have certain benefits not available to associations, businesses, and other types of organizations. On the other hand, researching and applying more complex and/or intricate legal issues may require the skills of one trained in the law. Since the ELC has depended upon pseudo-lawyers for guidance not only to design their own methods for church organization but also to analyze the BLC method of church organization, they not only totally mis-characterize the latter but also set churches up to be legal entities. They then purport to have found “Biblical” as opposed to “legal” solutions, not realizing that they have in fact violated biblical principles for church organization by establishing churches with legal status. This is all explained in this booklet. The BLC was started by Al Cunningham, a born-again lawyer, who initiated the use of a DOT which creates an ordinary trust or an ordinary Bible trust into which a church may place their tithes, offerings and gifts to be administered by a pastor/trustee for the benefit of the true, equitable, and beneficial owner of the money and property held by the trust (the trust estate). The church is the trustor but the ordinary (Bible) trust is not the church, and the church is not the trust. The ordinary (Bible) trust is not a legal entity, and the church remains a non-legal entity (a spiritual entity only) so long as (1) the document(s) which establish the trust implement the correct principles and (2) the church does not act legally in any way. As to (1) in the last sentence, one must use a Declaration of Trust which establishes an ordinary trust, not a business or charitable trust or some other type of trust which is a legal entity. The ELC, as will be shown in these articles, before the first 8 chapters of this booklet was published, never referred to the law of ordinary trusts; this indicated that they knew nothing of it. After the publication of the first 8 chapters, Townsend suddenly backtracked, quoted a little from the law of ordinary trusts, but then added a ridiculous twist that further discredited his status as a legal authority. One who examines this booklet can see that these assertions are true. “Study to shew thyself approved unto God, a workman that needeth not to be ashamed, rightly dividing the word of truth” (2 Timothy 2:15; see also, After Salvation for Bible teaching on the responsibility of the believer to grow in knowledge, understanding and wisdom.) 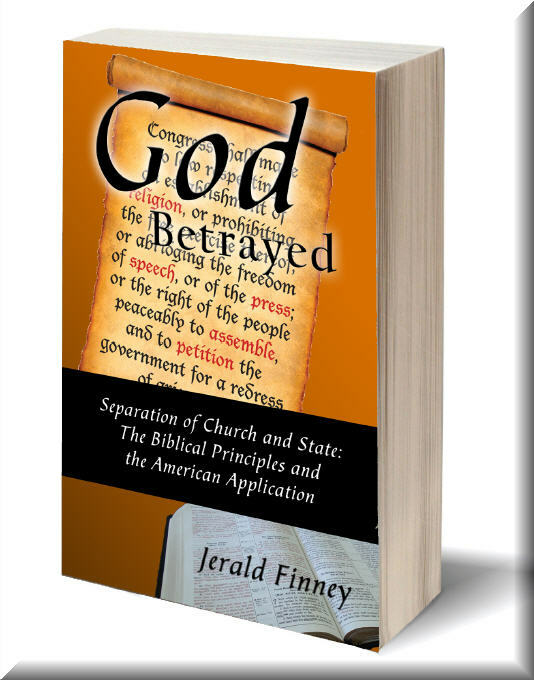 The initial period of intense study resulted in the book God Betrayed/Separation of Church and State: The Biblical Principles and the American Application. The author has continued his studies to this day and has published several smaller books, booklets, and tracts as well as many articles and audio teachings. All these books as well as other resources are free online. One can order 4 of the books in both Kindle and softback and 2 three in softback – go to Order information for books by Jerald Finney. This booklet is now available in online form only. The author concluded beyond any doubt that the DOT and the ordinary trust thereby created which are recommended by the BLC and now the ordinary Bible trust recommended by this ministry are flawless, both Scripturally and legally, if the DOT and other documentation, if any, do not set the church up as a legal entity. After an honest examination of ELC teachings concerning the DOT and the trust, one can safely conclude that both the ELC attacks and methods of church organization are without knowledge, understanding, and wisdom. Their teachers and leaders are untrained novices in the science of legal research and analysis. One purpose of this booklet is to expose the fallacies of their attacks and teachings; but that is not the main purpose. The primary reason for this book is to educate everyone who has an interest in these matters as to both the right and wrong ways for a church to organize. Nothing is more important than keeping the local church pure and chaste. Hopefully, the ELC and those churches who depend upon them will come to a knowledge of the truth and repent. This ministry will repent of any error brought to our attention. Our goal is to glorify God, and that cannot be done by letting pride, motive, or bias overrule truth. After Chapters 1-8 were published online, Ben Townsend of the ELC responded in an article called Give and Take. In that article, he admits that he knows very little about trusts. Chapters 9 and 10 respond to that article. “These are not Biblical instruments for Lordship Churches. They attempt to tell us that their ‘Trust’ is not like any other Trusts. And MY dog is not like any OTHER dog! You have your ‘Business Dogs,’ your ‘Revocable Dogs,’ ‘Living Dogs,’ ‘Charitable Dogs,’ and I am sure Attorney Finney has an ‘Ordinary Dog.’ And just because he may call his Ordinary Dog’s tail a leg, it does not make it have five legs.” Townsend later admits, in online publication, more or less, that there are different kinds of trusts and that the ordinary (Bible) trust is not a legal entity. Chapter 12 analyzes Ben Townsend’s article God is our Benefactor; He is NOT a Beneficiary and explains some terms which Townsend admittedly misunderstands. The believer who wants to know the truth now has a resource on which he can depend, in spite of all the continuing ridiculous tirades which this author has been told the ELC continues to publish. 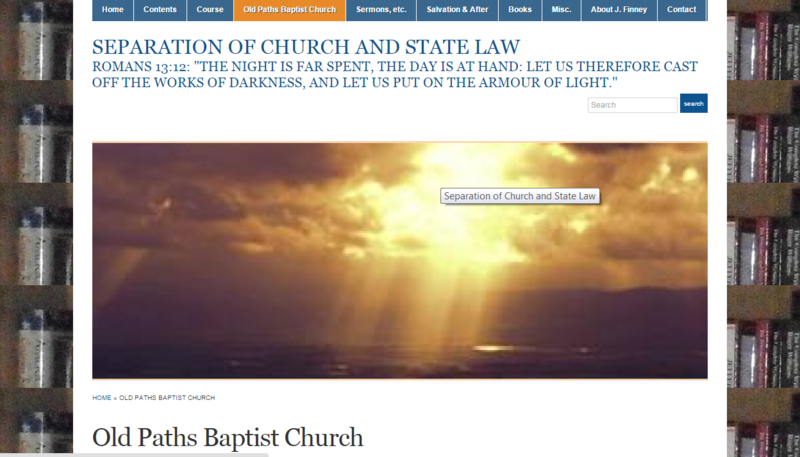 The Old Paths Baptist Church Separation of Church and State Law Ministry recommends a very specific form of ordinary trust which is designed to satisfy all relevant Bible principles and to close the door to all attacks which would seek to place a church under civil government. This trust is an ordinary trust, but the ministry calls it an ordinary Bible trust or a Bible trust because the language of the Resolution to Adopt the Declaration of Trust and the Declaration of Trust, signed by the male members in good standing with the church, articulate all relevant Bible principles so as to leave no crack in the armor or shield though which “wicked powers and principalities in high places” may thrust their fiery darts. A new website, ABIBLETRUST.COM, is being launched by this ministry which will show churches all they need to know about the Bible trust.